Children have an amazing capacity to learn, especially during the preschool years. As teachers of these young minds, we have a tremendous opportunity and responsibility to guide them to develop their natural sense of curiosity and learning. We have the power to set these children on the path to learning that will influence the rest of their lives! Through Primarily-Kids, I have designed the "Setting the Stage for Learning" preschool and kindergarten curriculum resource system with that opportunity and responsibility in mind. As teachers acting as facilitators, this curriculum demonstrates how to create a classroom environment enriched with pictures and objects that promote that desire to learn. Creating a new "world of discovery" for children to step into each time a thematic unit is introduced. By making simple changes in the way your classroom looks, feels and is interacted with, you can entice your students to learn about dinosaurs, nursery rhymes, the farm, outer space and more, even as they play with blocks, in the kitchen, or at designated centers. As a veteran teacher of over 30 years, I have been involved with preschool aged children for most of my life. Certified in Special Education and Early Childhood Education and a Masters in Reading and Literacy, I have worked with both special needs and general education students. I have owned and operated a preschool, directed a large childcare center, and started a non-profit organization that has developed an educational resource and referral center to meet the needs of local child care providers. I am committed to improving the quality of instruction for young children. I live in Waterford, Virginia with my husband and three daughters and run my Primarily-Kids business of curriculum development and teacher training out of my home. Writing this curriculum resource has been a labor of love and of mission. Like many major events in our lives, the idea and motivation for creating “Setting the Stage for Learning” evolved over time, and as a result of three different experiences. Each experience contributed to the final formation and completion of this curriculum resource system. I owned and operated my own preschool. At that time, I was trying to direct the preschool, teach the classes, train the staff and do the myriad of other duties and responsibilities of having a business PLUS take care of my family with two young girls. I was often overwhelmed. To simplify life and my responsibilities, I decided to order curriculum so I wouldn't have to spend hours and hours planning every month. I purchased a monthly program that looked and sounded wonderful and seemed to meet our educational needs. I ended up disappointed and frustrated. I found the curriculum repetitive and boring. After all, how many times could you paste yarn on an animal picture? I ended up having to add, revise, research and adapt so much every month that I thought, “I should have written this myself!” That planted the seed for the creation of “Setting the Stage for Learning”. Over the next 5 years, I experimented again and again in purchasing curriculum and/or curriculum resources, only to find many things unfulfilling or differing in philosophy with each and every one. I gave up and went back to creating my own again and vowed to “one day” publish my own curriculum. In the next phase in my evolution towards writing curriculum, I worked for two years as a director of a large child care center. This experience truly opened my eyes to the world of child care. In this setting, I worked with top quality staff: they were child-centered, well-trained and truly cared about the children in their care. And yet…I realized that we had children who spent almost every waking moment in our care. How different from the preschool world! This realization also made me painfully aware of the challenges these little children faced, even in quality settings, and with challenges neither of which the children or the center had much control over. No matter how good this program was, there were obstacles we would have tremendous difficulty trying to change about their care. Obstacles such as not being able to eat or sleep when they wanted or needed (“Honey, it’s not quite time for lunch.” Or “Wake up dear, naptime is over.”). These children did not have space or toys they could call their own (“He is allowed to sit there too!” or “Sweetie, we have to share those with everyone.”) and could not choose inside or outside playtime on demand (“I know you are having fun, but its time to go in now.”). Although even children at home cannot always make these choices all of the time, I knew that, from Monday to Friday, these were not options for our children. I recognized what a gift I had given my own children by allowing them to choose many of these things on a daily basis as I worked from home or on a part-time basis. This realization of the powerlessness children in child care experience hit me hard. I knew that what we as early childhood professionals do to create a warm, loving, engaging and responsive environment is not just important, it is critical! Now, it became my mission to do what I could to improve the lives and choices of these precious children and I began formulating my curriculum system. The final phase and realization that spurred me to actually finish writing and then publish “Setting the Stage for Learning” came to me when I was back in the classroom teaching second graders in a public school. I was nominated for the Agnes Myer Outstanding Teacher of the Year award. What an honor to be so highly considered by the parents and my peers. How wonderful to be acknowledged for providing an environment where my students wanted to learn. But, what a responsibility too! It became clear to me that my purpose in life is to enrich the lives of children. I knew that in the classroom, I could reach about 20 children at a time. By locally training teachers and opening their minds to new philosophies, ideas and perspectives, I could perhaps make an impact on hundreds of children. But, by training and publishing a curriculum system that supports these teachers so that they can now take these philosophies, ideas and perspectives and create this environment, a “world of discovery”, giving them the tools, procedures and resource suggestions to make it happen, would perhaps enable me to make a difference in the lives of thousands of children. 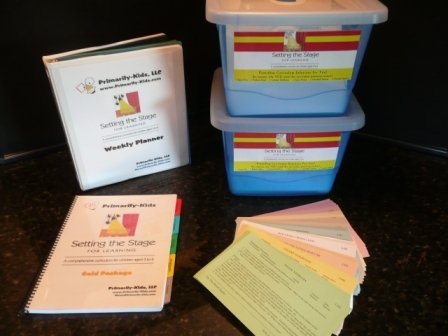 And so, I put over 30 years of experience as a parent, teacher and director into this hand-crafted treasure box. This treasure box is filled with tried and true activities children love because they stretch their imaginations and empower their choices. This treasure box is also filled with the practical tools teachers need to set the stage for learning and bring fun back into the classroom! And here we are today, my mission just beginning….